Everybody has the right to build a business from anywhere and design a lifestyle they love. That's what this book will teach you to do. If you've always thought that having the freedom to do what you want when you want was just a pipe dream, then think again. Right now there is more opportunity than ever to: Package and sell your existing knowledge and skills to earn enough to work and live anywhere Build a profitable online business from your laptop that creates real impact in the world Use online tools, social media and outsourcing to give you more time, money and freedom Travel the world for less and experience the joys of minimalism Live life on your own terms and create your ideal lifestyle. This book uncovers the three stages of building a freedom lifestyle business including the mindset you need, the nuts and bolts of setting up an online business you love and the blueprint to create your ideal lifestyle. After 8 years of working in the bureaucracy of the corporate world, Natalie Sisson quit her high-paying job to fly to Canada, start a blog and cofound a technology company. In just 18 whirlwind months she learned how to build an online platform from scratch, and then left to start her own business, which involved flying to Argentina to eat empanadas, play Ultimate Frisbee and launch her first digital product. Strike forward five years and she now runs a multiple six-figure business from her laptop, while living out of a suitcase, and teaching entrepreneurs worldwide to build a business and lifestyle they love. If you're just starting out, this book will show you how to package and sell your knowledge and skills, or those of others and build an online platform to earn enough to work and live anywhere. If you're an entrepreneur, this book will show you how to establish your business online, reach a global audience and build a virtual team to give you more time, money and freedom. This is a practical guide to learn what it takes to be a digital nomad and develop the freedom-based mindset to truly live life on your own terms. ----------------------------------- Editorial Reviews "Plenty of people want to travel the world and run a business from anywhere, but only a small percentage of them transform their dreams to reality. Of those who make the leap, few can explain it well. Natalie Sisson is the perfect exception: a suitcase entrepreneur with a track record, who can also show you exactly how it's done. Read this book and choose your own adventure." Chris Guillebeau, NYT bestselling author of The $100 Startup "Natalie mixes the very best of fun and inspiration with practical, actionable tools to get you set for a viable location independent business. While there is specific travel-related information, any entrepreneur will benefit from learning how to have a lean, flexible business." Pamela Slim, author, business coach escapefromcubiclenation.com "The Suitcase Entrepreneur" is a real gem: it contains more resources than I have seen in any other book of its type, and is the ultimate one-stop-resource for budding suitcase entrepreneurs. This is not a book that sketches out a dream and leaves you hanging, it tells you exactly what that dream can look like and the exact tools you can use to get there, starting now. Marianne Cantwell, author of best seller Free Range Humans "Natalie Sisson is someone who truly walks her travel talk: her typical day involves a combination of adventure, running her business, making meaningful friendships, conquering athletic feats and changing lives - and that's just a baseline. 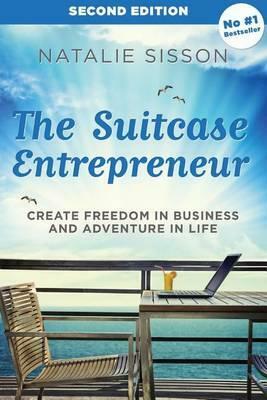 This book is the perfect jumping-off point for anyone who wants to create their own freedom in work and life." Jenny Blake, author, speaker and micro-business coach at JennyBlake.me"
Natalie Sisson is a global adventurer and digital nomad who is on a mission to create freedom in business and adventure in life, for herself and 1,000,000 entrepreneurs by 2020. Natalie believes that you should be able to create your ideal lifestyle on your own terms and teaches entrepreneurs all over the world how to build an online business you can run from anywhere using online tools, social media and outsourcing. Based out of her suitcase for five years, with no home base, she runs her multiple six-figure business from her laptop while traveling the world launching digital products and programs to help you save time and money to build a business you love that supports your ideal lifestyle. She has worked with thousands of clients to design a profitable lifestyle business they love and inspired her freedom fighting community to take action through her highly popular blog, podcast and lifestyle video series, as well as through events, retreats and speaking engagements. Originally from New Zealand, Natalie has citizenship in the United Kingdom, permanent residence in Canada, has travelled to 69 countries and lived on 5 continents. After getting two business degrees in just four years and mastering her marketing and business development skills over 8 years in the corporate world, Natalie went on to co-found a technology start up in Vancouver in 2008 which is now the number one fundraising application on Facebook. Among many other publications and media outlets, she's been featured Yahoo Finance, The Guardian, The Age, New Zealand Herald, Huffington Post, Forbes, American Express Open Forum, Mashable, Visa Business Network and Social Media Today.